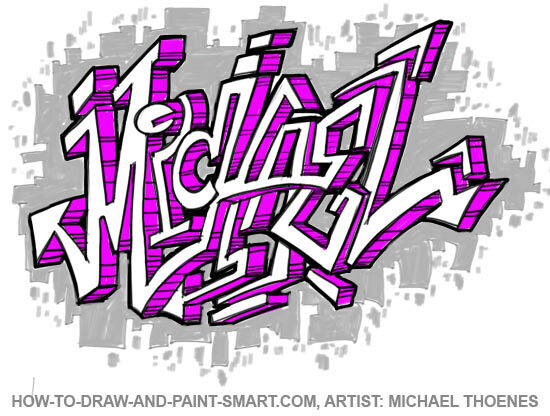 Learn How to Draw Graffiti Letters - Write Your Name in Graffiti. Drawing graffiti Letters is cool! What to write may be the first question you ask yourself when you want to learn How to Draw Graffiti Letters Write Your Name in Graffiti and adapt this lesson to your own name or graffiti tag. Why turn your own name into an expressive piece of graffiti art? You may want to create the name “Michael” from the lesson and then use what you have learned or just be bold and start with your name from the beginning. The techniques from the lesson can be used with any name or word. Recommended art supplies: paper, pencil, colored pencils or markers. For digital drawing a computer drawing tablet is recommended. 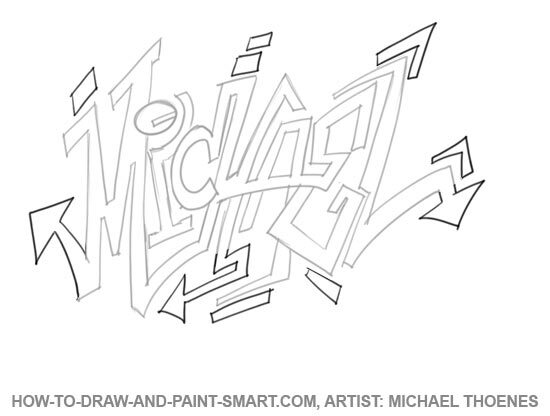 Now let's get started with "How to Draw Graffiti Letters Write Your Name in Graffiti." 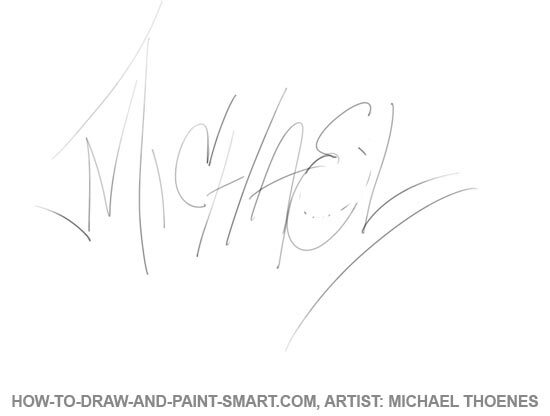 Begin your graffiti name drawing by sketching your name expressively on piece of paper. Draw lightly as you may want to adjust some of the letters. With my name, Michael, I tried to add some symmetry to the design by adding an extension which hooks off the letter “M” and mirrors the way the letter “L” is shaped. Using your sketch as a guide, draw 2D letters around your sketchy letters. Look for interesting ways to connect letters to each other. For instance notice how the “M” connects to the “H” and also how the “C” connect to the “H” as well. The “H” and “A” also connect to the “E”. This may take you several attempts. If you decide you are not happy with the way your design is going, set it aside and try another variation. Keep each attempt and borrow ideas from them. Graffiti artists often trace of copy parts of design sketched that fit well together. Add arrows and splits to your designs. Splits look like pieces that may have broken off your letters. Arrows, well you probably know what an arrow looks like. Where you add the arrows depends a lot on the letters you are using. You really can’t do this this wrong. you are the designer so experiment with what looks and feels right in your design. Add a shaded edge to your letters. This is accomplished by copying the right edge of your of your letters slightly offset from the original letter. Use short lines to connect this new letter edge to the original letters. 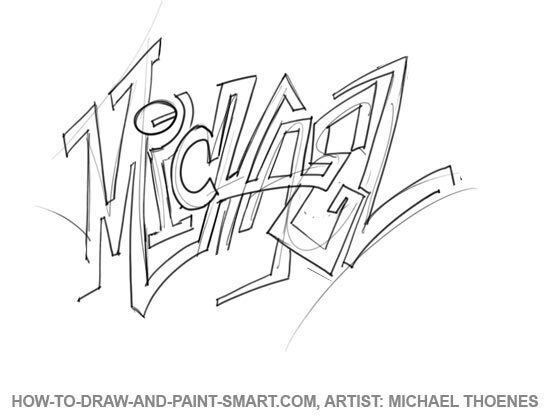 The lesson How to Draw 3D letters shows this clearly with some letters that are more simple that this name. Check it out if you are not sure about how to do this step. I have colored the edge orange to help it to stand out and be seen clearly. Take your time, because this can get a bit complicated. Before completing your letters it is a good idea to decide if you are gong to have a background for your design. backgrounds can take the shape of clouds, brick, blocks, bubbles or blobs. I find that deciding on my background helps me to think of the design as a whole piece of art. One could finish the letters first. It is a matter of preference. Thicken the outside border of your letters and add horizontal shading lines to your edge. Lines drawing close together have the effect of darkening an area. Usually this is done more in areas that may be shadowed if the letters were actually dimensional. Additional lines near the centers of the edges mimic possible reflections that a shiny dimensional letter might pick up. Here is the same design in Purple. 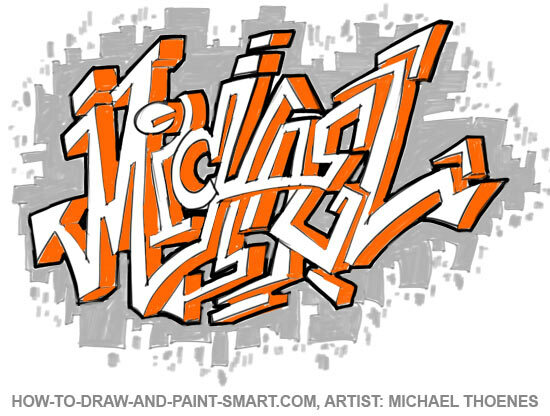 "How to Draw Graffiti Letters - Write Your Name in Graffiti!" 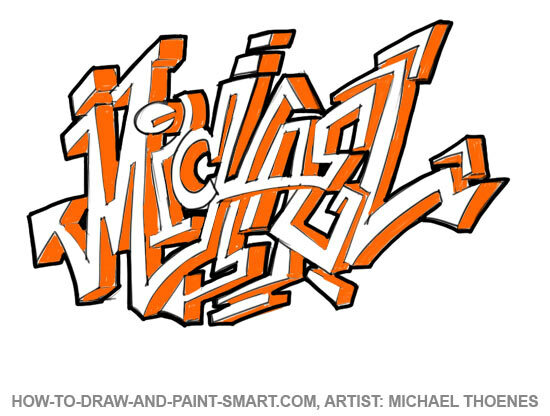 Learn more about Drawing Graffiti Letters by viewing pictures of graffiti from around the world.